• Chain operated blinds are a safe and functional option with a choice of chains available at no extra cost. 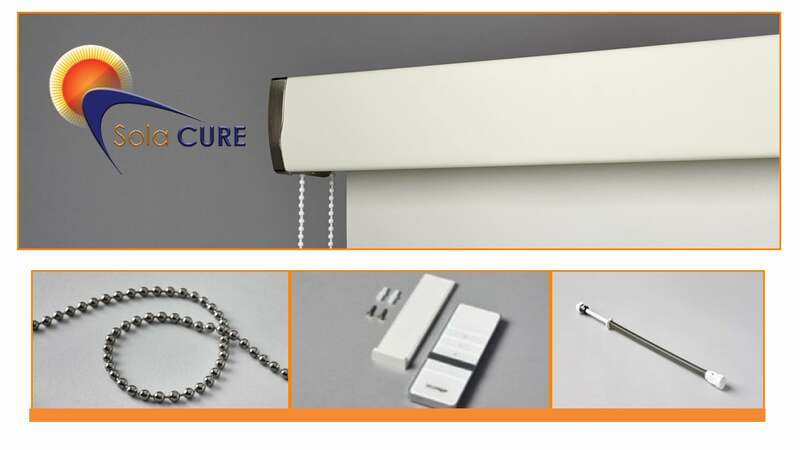 • Each chain operated blind is supplied with a child friendly chain and cord safety device. • Spring operated blinds eliminate the need for operating cords or chains. They can be locked at various positions providing partial and full coverage. They are released with a short pull on the bottom bar of the blind. • For restricted spaces, Sola-Cure offer a special low-profile blind that sits just 40mm away from the wall. • Lithium battery powered blinds are ideal for retro-fit applications as they eliminate the need for wires. The motor can be recharged when required (approx. every 600 operations).